The crown represents the mountain vistas seen from Belcarra. The shamrocks honour the Irish heritage of Belcarra’s founder. The eagle refers to Belcarra’s magnificent natural heritage. It also symbolizes the powerful spirit of the community. The bear and stag allude to Belcarra’s natural heritage. 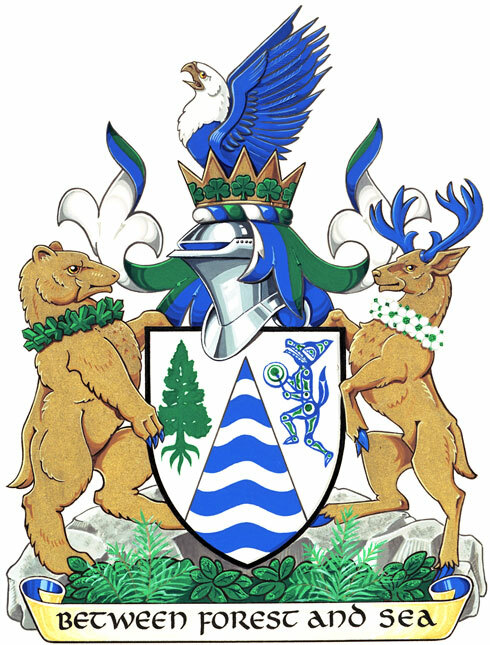 The collars are a reference to Belcarra as a British Columbian and Canadian municipality. The gold refers to the light and warmth of the community’s spirit. The salal plants, sword ferns and rock continue to celebrate Belcarra’s geographical features. BETWEEN FOREST AND SEA is a phrase that has long been used as the motto of Belcarra.